Low population densities are often cited as the reason why high-speed rail would never work in the United States. While it’s true that typical American metropolitan areas sprawl far and wide, many larger cities are still relatively dense, and a surprising number of our states are as dense as some European nations. California, for example, has just over 90 people per square kilometer (234 per square mile), while Spain has 88 people per square kilometer (231 per square mile). Given the success of Spain’s rail system, it stands to reason that California would be fertile ground for high-speed rail. It’s probably not a bad argument to make, and one that sheds some light on why the Obama administration directed money toward certain states for rail upgrades. Ohio and Florida—both of which unfortunately rejected rail funding—are about as dense as France, a world leader in high-speed rail.¹ Illinois, Virginia, and North Carolina sit one density level down, but are on par with Spain and Austria, both of which host high-speed rail. As a state, Illinois may be a poor example since 75 percent of the state’s residents lives in the Chicago metro area. But if you look at the wider region—from Milwaukee to Detroit to Toledo, with Cleveland, Columbus, and Cincinnati not much farther away—you can see where the Midwest upgrades were headed. Despite many regions with densities favorable to high-speed rail, only the Northeast Corridor hosts true high-speed rail, the Acela Express. It serves a relatively small fraction of the country. 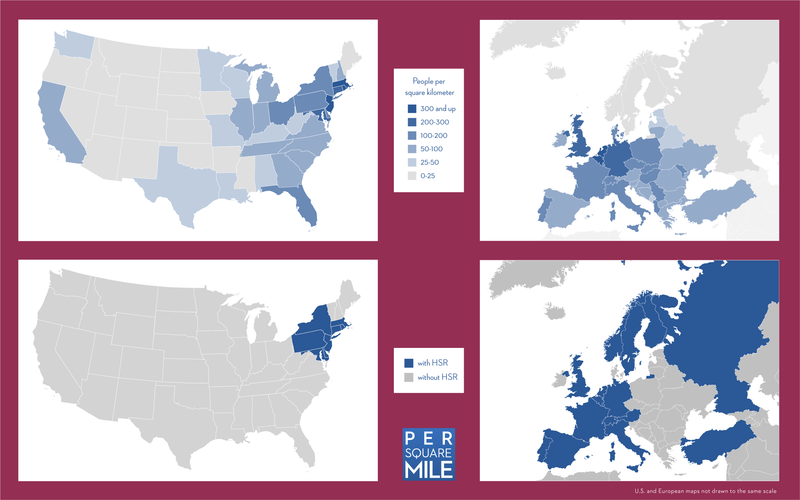 While the Northeast Corridor is most crowded in the U.S., many European nations have proven that high-speed rail can work at much lower densities—densities which are seen across the U.S.